n jump very high. Normally they can jump a fence, which is why you should also invest in string or taut wire across the top. You can also use commercial repellents as well. 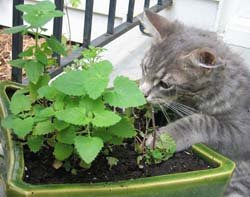 Commercial repellents use scents to keep cats away, and shouldn't be used near any food crops. Due to their high chemical content, commercial repellents can pollute your crops. You can find them at your local department store, with several varieties to choose from, many of which will fend off other animals from your garden as well. If you have a garden, it can be very annoying if cats and other animals decide to make your garden their home. If you stick to your guns and do your part, you can prevent them from bothering your garden or your crops. Once you have secured your boundaries around the garden, you should try using water first. If water doesn't seem to work, you can look into another method, such as commercial repellents.